Make strawberry shortcake with basil whipped cream and coconut cornbread for a cookout or celebratory dessert. This recipe appears in the "Muscadine Time" episode of A Chef's Life, featuring chef Vivian Howard. Cornbread: Preheat the oven to 350. Combine and mix to incorporate the cornmeal, flour, sugar, coconut flakes, baking powder and salt in a mixing bowl. In a separate bowl, combine the vegetable oil, melted butter, honey, beaten eggs, coco lopez, coconut milk and coconut extract. Pour the wet ingredients into the dry. Stir to moisten. Put about 2 Tbsp. butter into a small casserole dish and place it in the oven. Allow the butter to melt and brown slightly. Take the dish out of the oven and move it around to make sure the butter is coating the inside of the dish. Pour the batter in. Bake for about 15 minutes until golden brown. For the Strawberries: Top and wash the berries. Slice each berry into 4 or so pieces. For 1 cup of sliced berries, sprinkle 2 or so Tbsp of sugar. Toss to incorporate and let this sit for 30 minutes or until the berries produce a syrupy delicious sauce. For the Basil Whipped Cream: Steep 2oz basil (stems and all) in 2 cups heavy cream. Strain out the basil and allow the cream to chill. In a mixer fitted with the whisk attachment, or with your good old arm fitted with the same “attachment,” whip the cream to medium stiff peaks. To Assemble: You can go wild here to fit your needs. At the restaurant we use Ball canning jars. You could use a trifle bowl, a sundae dish or a wine glass. It is however nice to see all the layers, so keep that in mind when selecting your vessel. Spoon a small amount of your strawberry love on the bottom of the vessel. Top with coconut cornbread that you have torn into smallish pieces. 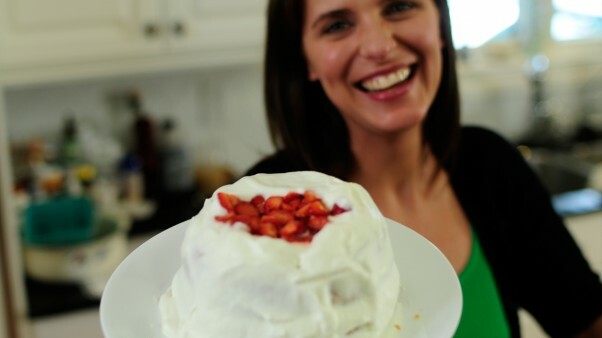 Top that with a nice amount of strawberry dream stuff and finish that layer with several dollops of basil whipped cream. Continue this layering process until you reach the top of your vessel making sure that you finish with the basil whip. Top the whole thing with a few whole or halved strawberries. In a perfect world you would let this sit refrigerated for a minimum of six hours before serving, overnight would be even better.